Hope Chris did a lap of the beach! There were 8 PBs to report at this week’s parkrun with Martin Thomas finishing in 18:49, Richard Sheehy in 19:22, Stephen Dallow in 21:34, Claire Sullivan in 23:09, Lucy Atkin-Smith in 24:54, Sharon Woods in 25:18, Beth James in 26:38 and Nicola Lewis scoring yet another PB finishing in 26:47. In addition all those PBs, our first Honorary Member, the one and only Steve Jones, was in town and more than happy to post for photographs with club members. 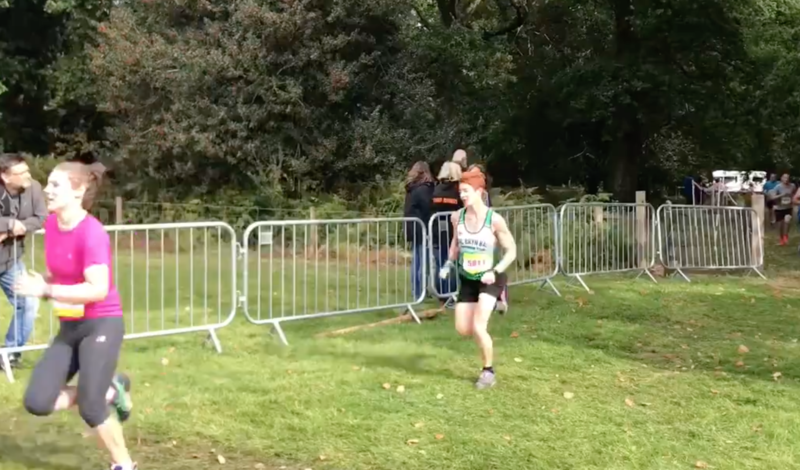 There was a good turnout for the Forest of Dean Autumn Half Marathon and there were some great results to report. Sam Lewis Jones finished in 6th position overall and both Sarah Jeremiah and Daisy Evans had a PB. It was actually Daisy’s first ever half marathon and finishing in 01:45 on a tough course means she would do much better on a flatter course. Suzie Tew travelled to Blenheim Palace on Sunday to support her friend who was running her first 10K race. She of course took the Forza top for a pre-race photo. The inaugural Llandegfedd Reservoir 10k took place on Sunday morning and Delphine, Rebeccah and Mark were representing the Green Army. At just under 6 miles the scenic course features a mixture of terrain including fields, trails and tarmac. The race was organised by a group of students in aid of the Princes Trust and hopefully will return next year. It’s worth pointing out that the course follows an established circular path that can be run at any time and starts/finishes at a cafe! Leigh-Anne Vowles travelled to Glasgow for the Bank of Scotland Great Scottish Run and whilst there just had to pose for a photo with ‘Coneheid’ and do a bit of important pre-race carb loading. Sarah Williams was back in action this weekend after some foot issues running the Sepsis 6K in Swansea. She was also joined by Julie Parry Bishop and Rhian White. Stephen Dallow was flying the flag for the Green Army at the Cowbridge 10K. The run between Bryn Bach Park was relatively uneventful until the group hit the treacherous tram road just outside Talybont. Its first victim was Kim and shortly after it dragged down Ceri Caswell! Ahh flying feet, almost the sign you’ve made it as a runner when you get photographed both feet mid-air. Even as a veteran runner I’m sure you’d rather your feet to be flying than not. The Snowdonia boys were up bright and early for a 20-miler around Pengenfford and Llangorse in preparation for next month’s Snowdonia Marathon. Claire Sullivan was also getting some Snowdonia training in with a bimble up the Tumble. Dave’s not training for Snowdonia so was just doing it for fun. No Replies to "Weekly Roundup, September 24th – September 30th"